The ribbon cutting for Secure Retirement. Photo by Charlene Rule. A new one-stop financial, legal and tax firm opens its doors in the Robson Ranch Center. Secure Retirement Solutions opened its doors in early October. They offer a team of experts in financial planning, investments, wills and trust reviews and preparation, income tax return preparation services and a complete line of insurance products including annuities, life insurance, auto and home insurance and Medicare plans. They even offer complimentary notary services. 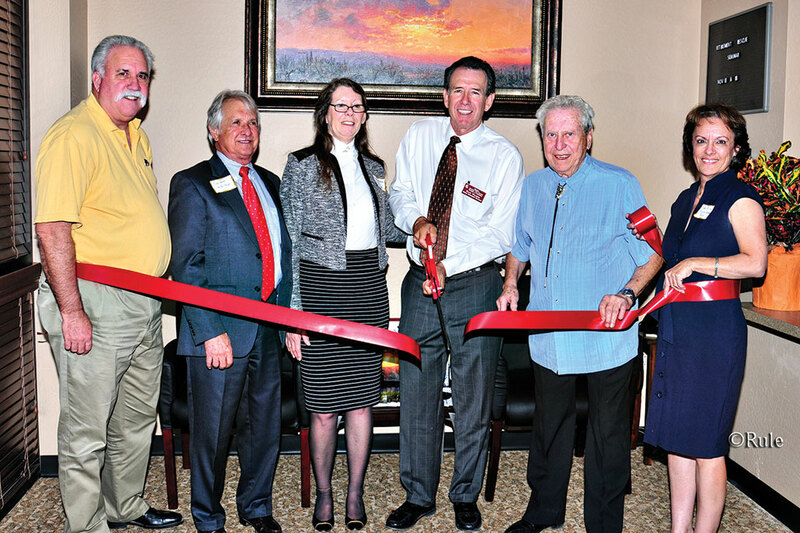 The official ribbon cutting was conducted on November 10 by the Casa Grande Chamber of Commerce. Over thirty people were in attendance at the ceremony. Elected officials in attendance were both Mayor Bob Jackson of Casa Grande and Mayor Joe Nagy of Eloy. Some of the Robson Ranch residents in attendance were Mel and B.J. Foster, Ken and Kathy LaFord, Mike and Carol Simmons, Jerry and Judy Mattson, Al and Barbara Hager and others. Secure Retirement Solutions and its president Dave Wilkins have been long term supporters of Robson Ranch clubs and their activities. They were a sponsor this year of the Support Our Troops Veterans Day Golf Tournament. This was the third year in a row they have sponsored this event. Dave has also donated his time and money operating the Hydration Station for the annual Pickleball tournament each March. Please stop in and say hello to Dave and his team of professionals and collect a free gift. They are between Elite Blinds and Shutters and Grande Valley Golf Carts. You can reach them at 520-423-6800.